Email mailshots are becoming an essential ingredient in keeping your customers up-to-date with the latest products or services you offer. Whether it be the sole purpose of making ongoing money to your business or delivering a strong support service for your product it is an essential part of any ecommerce business. It is also an economical and viable way of marketing over viral (hand delivered leaflets) or radio/television (digital marketing) or even PPC (Pay-per-click) marketing / organic search engine optimisation. Designing an email newsletter isn’t as straight forward as it first appears. Yes it’s essentially HTML with a bit of graphics. However, with sophisticated email services, images are often stripped when they arrive in a customer’s email box and as such content needs to displayed in alternative ways so it catches the attention of the individual. With 10 years of experience in delivering both email newsletter designs campaigns and tools such as Ad-Email we are able to measure click throughs and identify key products and target subject headings to bypass spam engines and thus increase sales and interest. The email marketing platform we build on allows us test the emails on different email clients i.e. Outlook, Yahoo, Gmail and Yahoo. Tools such as DotMailer, MailChimp and iContact enable us to test and deliver the newsletter at scheduled times as well as monitor the success of the campaign. 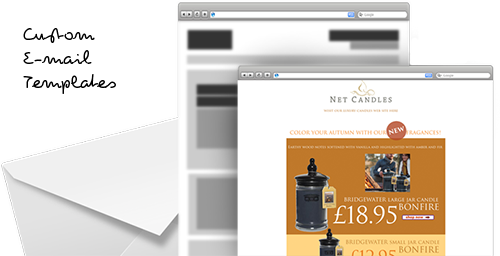 Interested in finding out more eMail Marketing and Mailshot Designs for your Business? Please Contact Us for a free consultation on how we can help.